These safety glasses feature polyurethane foam padding against your head to add extra protection against dust and flying particles and splattered finishes. They have 99% UV Protection and angle adjustable temple supports. 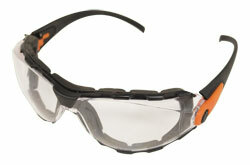 Go-Specs feature Supercoat anti fog coating and are high impact resistant and are tested to ANSI Z87 (+). The lenses are 1.8mm thick Polycarbonate with a base 6 curvature.